Jesse Muhammad (JM:) When did you fall in love with Saviours' Day? When was your first time attending? How did it make you feel? 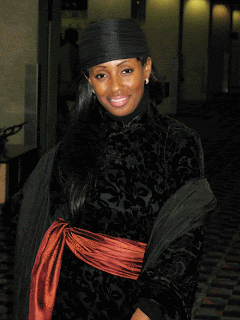 LaTonja Muhammad (LM:) My first Saviours' Day was 1993. I had never seen so many black men and women treating each other with so much respect. I was so proud, in particular, of the men that I saw. They looked so strong and dignified. I fell deeper in love with this teaching that it could produce that kind of effect in a people who were considered no people at all. (JM:) Last year at the annual convention you organized a workshop titled "The Michelle Obama Effect". What motivated you to have a workshop with that title? What was the overall response and impact of that session? (LM:) The Michelle Obama Effect was birthed out of a desire to explore the impact of the first Black Woman - a descendant of slaves, to become First Lady of The United States of America. Black women in this country have always been viewed as "second" best, even by our own men when they obtain positions of power and influence. So, when Michelle Obama delivered her speech at the Democratic National Convention in August of 2008, I was on my way to Denver the next day; tears flowed from my eyes as I walked through the airport and saw every newspaper had Michelle's image on it. And for the first time, I saw Black women actually smiling and speaking to each other, not out of formality, but out of sincere respect. You know it's like the movie, "Waiting to Exhale". I think we all were able to exhale because for the first time a more accurate picture of who we are as women, was/is before the world. We are second to none! The scriptures put it like this: the last shall be first, and the stone that the builders rejected would become the corner stone of the new world. That panel was a way to celebrate Michelle, not as an individual, but what the world loves about Michelle is the essence of the Black female. We are brilliant, strong, caring, maternal, and oh-so stylish!! Mrs. Robinson, Michelle's mom, said it best, "Michelle and Barack aren't new. There are thousands of Barack and Michelle(s) all over this country." And I wanted to honor the Michelle in all of us. (JM:) For Saviours' Day 2010, you have put together a panel of illuminating women for the workshop titled "I Am Woman" to be held on February 27. Who are the panelists? What message do you want attendees to walk away with from this seminar to take back to their respective cities? (LM:) “I Am Woman: Awakening Your Spirit of Excellence and Virtue” is taken from Sojourner Truth's 1851 speech "Aint I A Woman?” during the Women's Rights Convention. At that time, she challenged the rights of the Black female to equal education, religion, and our right to "exist" as women. This workshop takes a look at the history of the "sojourn" of Black Women in this country. How far have we come? How far have we strayed? How do we answer the "Aint I A Woman?" It's an extension of last year's dialogue on the Michelle Obama Effect. From Sojourner Truth to Michelle Obama, our advancement as women has come from our intimate relationship with God or the I AM. Black women have been the spiritual backbone of our families and Allah (God) through the female has guided us through trouble times. Through a partnership with Sister Audrey Muhammad of Virtue Magazine, we have assembled a panel of women who have helped us grow closer in our relationship with Allah (God) to achieve real success. I'm very honored that Mother Tynnetta Muhammad, wife of The Honorable Elijah Muhammad will be joining us, Dr. Ava Muhammad, and the great Dr. Iyanla Vanzant. Also joining us is Zondra Huges, editor and chief of N'Digo Megapaper and former relationship editor for Ebony Magazine.Atiya K. Salaam of L.E.A.P International, is co-sponsoring the event along with the Susan G. Komen breast cancer movement. Just two days ago a study was released about the racial disparities of breast cancer, stating that advanced breast cancer diagnosis among Black women remains 30 to 90 percent higher compared to white women. And Black women are still more likely than all other women to die from breast cancer. So, we're excited about the breast cancer material that is being provided by the Susan G. Komen organization, because we shouldn't be dying from a disease that can be beat. And an example that it can be beaten is in our moderator of the panel discussion who is a breast cancer survivor, WVON's news director and author of "The Pocket Book Monologue," Sharon McGhee. (JM:) What else are you looking forward to during this year's Saviours' Day convention? (LM:) I'm really looking forward to Minister Farrakhan's lecture The Time and What Must Be Done. We are in a very serious time as never seen before. Everything that the Honorable Elijah Muhammad has taught we are experiencing it today. The Minister is no doubt a Divine Reminder of his teachings and Warner among us. When the earthquake hit Haiti, the Minister warned us that we must prepare because what came upon Haiti would soon be at our doorstep. The 4.3 earthquake that hit Chicago last week was evidence of the Minister's warning just a couple of weeks before. I happened to have been up during the quake and felt the house shaking. We can no longer afford to waste time; when we are given an instruction we must move out on that instruction because in this hour it will be the difference between life and death.